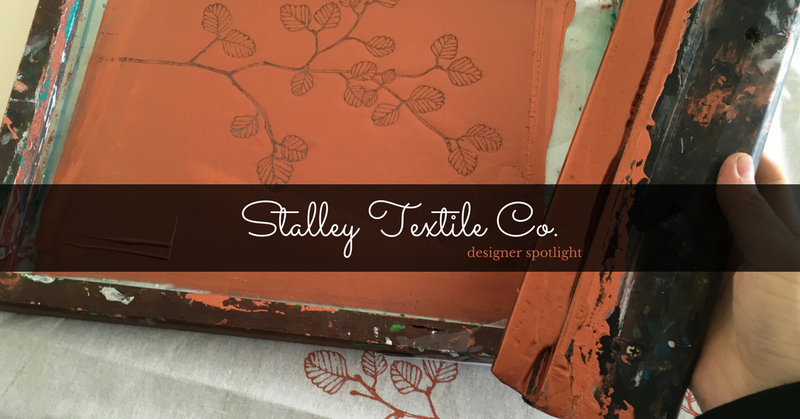 Designer Spotlight: Stalley Textile Co.
Hi there, my name is Stalley; yes, it’s unusual, isn’t it? Stalley (pronounced Sally with a T, or stallion without the ‘on’) was my grandmothers’ maiden name but it is my first name. I have used it as my business name as well so that I don’t have to explain the meaning behind both. My company consists of myself, my little girl Emma, and my cat, Simone. We live in an apartment in Sandy Bay – a leafy suburb close to Hobart CBD and the beach. I have been selling on Made It for about five years. I didn’t put much thought into it at first, but now I am a full time designer and maker. My pieces are completely different now to those that I first started out doing, and they are continuously evolving. I have a tiny studio space that is so small that it is completely taken up by storage of all my sewing and screen printing equipment and materials. If I do need to use the space I will clear off the desk, but mostly I screen-print and sew on my kitchen bench top, and sometimes I sew in my lounge room on the couch, listening to an ibook or podcast. There is a fantastic view outside my lounge and kitchen windows of the river and mountains. 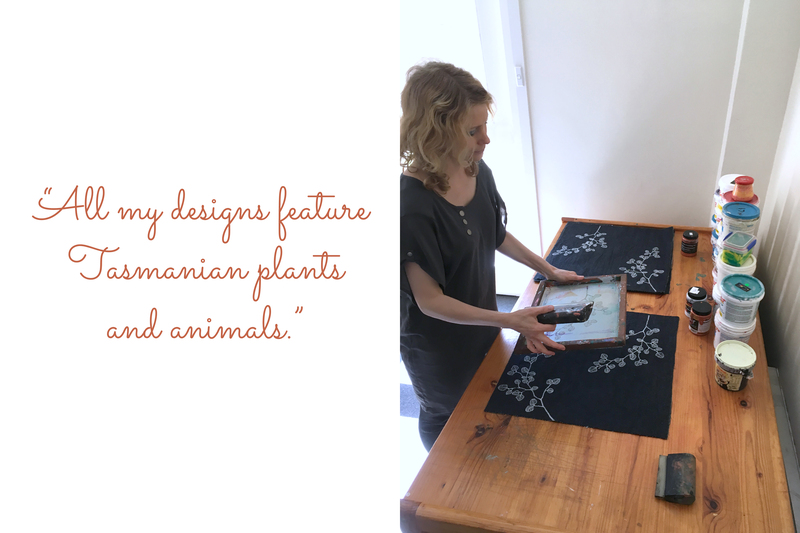 All my designs feature Tasmanian plants and animals, and the design process usually starts with being inspired by a particular plant shape or texture that I think would make a great print pattern. In the case of a native animal - echidna for example, I will see the spines as something that I would love to draw out in a print design. 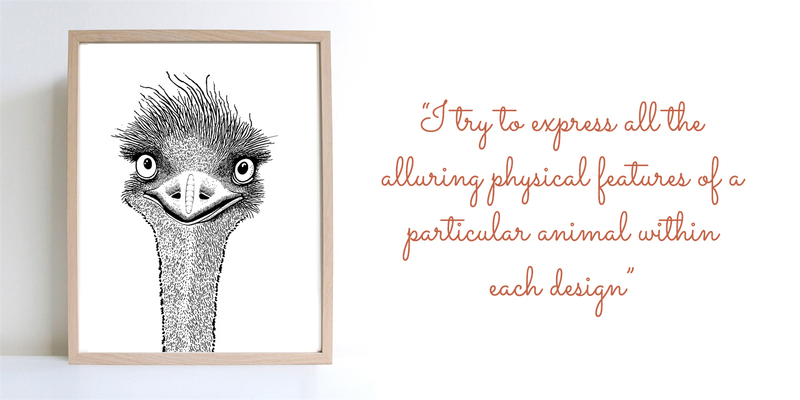 I try to express all the alluring physical features of a particular animal within each design – spines, whiskers, fur, ears, etc. Once I have the idea in my head, I start with either a photograph or a composite of photographs to create the image. I then use Photoshop to refine the image, then print it out, then use a pen and whiteout to add detail, and then scan the image and Photoshop once again. I repeat this cycle over until I am happy with it. I then send the image off to a screen manufacturer who creates a screen and sends it back to me. After university, I worked as an urban designer and planner for 11 years alongside any private interior design work that I was able to pick up from time to time. While on maternity leave after my first child was born, I opened my online (Made It) shop selling purses and bags. I really needed something creative to do with my hands during my leave because I had no baby to look after. He was stillborn at 38 weeks. Selling online seemed like a good idea as it did not involve leaving the house, or facing people in person. 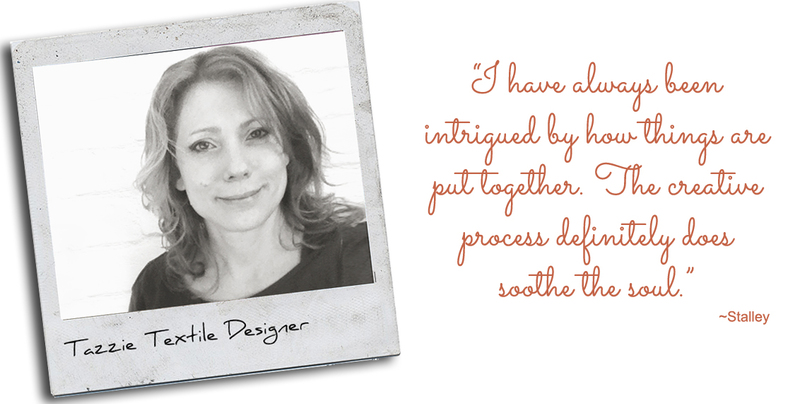 After my leave was up I returned to my corporate job, and, after my second child was born, I decided not to return to ‘work’ but pursue my handcrafted textile business full time, which by this stage incorporated my own hand screen printed textile designs into the pieces that I made. I have always been intrigued by how things are put together. My dad has made a lot of things - from farm machinery to musical instruments, so he has been a real inspiration to me. I have learned that if you can dream something up, then you can make it. Everything about what I do now - being my own boss, in my own business, creating and selling my own designs is extremely rewarding. The creative process definitely does soothe the soul. 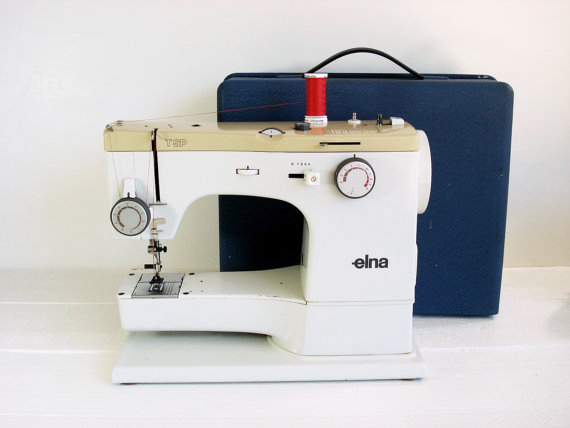 I have a picture of the sewing machine that I learnt to sew on. It went to sewing machine heaven last year. My Dad gave it to my Mum as a wedding present in the early 70’s. I think that generally, something that is made by hand is of a higher quality than something that is mass-produced. 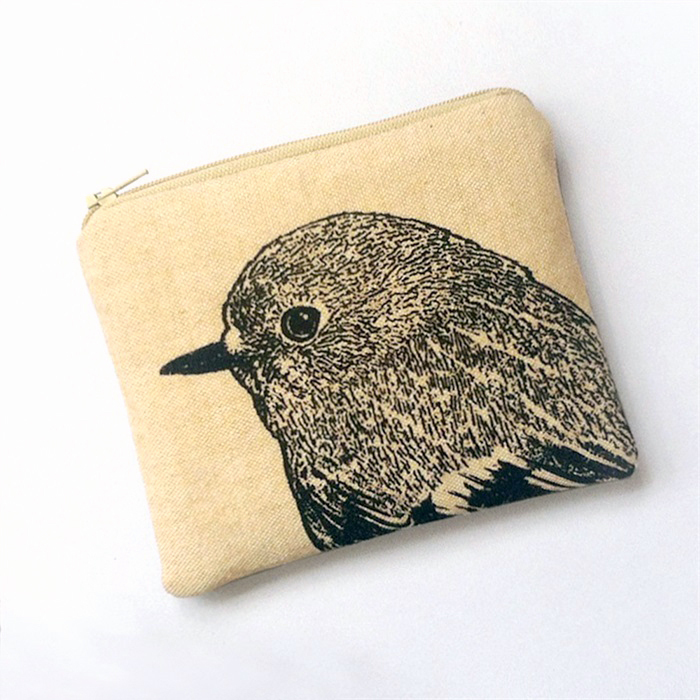 Buying handmade also ensures that you have a unique or small batch item. I take a lot of care with each piece that I create. Everything I make is sturdy and will stand the test of time. 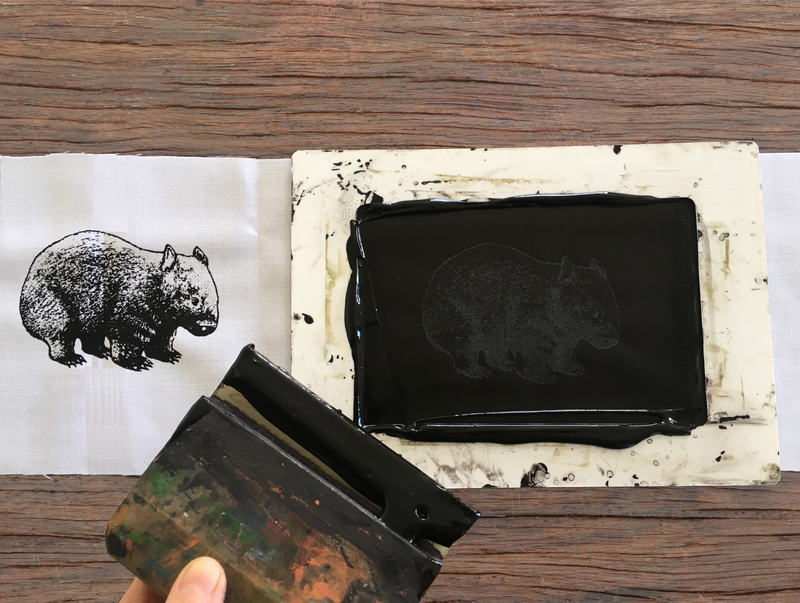 As Made It is an Australian company and my designs are distinctively Australian, I thought that Stalley Textile Co. and Made It would be a natural fit. I met Made It founders, Bec and Jayc, when they were touring Australia meeting makers from each State. I really enjoyed meeting them in person. About ten Made It makers had a get together at a local bar by the waterfront and it was just fantastic. Now when I log in to Made It, I feel a personal connection that I would just not get from any other online selling platform.